Global services data, released today, make it possible to complete the overall PMI readings for a number of countries. 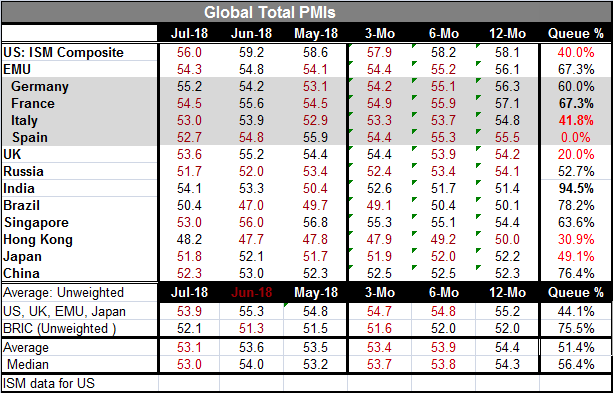 We have 14 reporting entities (I will double-count the largest four euro area economies by including the EU overall measure in this as well) of which only four showed total PMIs rising month-to-month while ten showed declines. That’s not a good ratio. Still, only Hong Kong shows an overall decline in activity (reading below 50). Brazil is close to the edge at a reading of 50.4. Over three months, ten entities show lower readings than their respective six-month averages. Improving on three months compared to six months are Singapore, the U.K., India and China. Over six months, nine entities are stronger than their respective 12-month averages. But over 12 months, only four entities are weaker than they were 12 months ago (previous 12-month average). Unweighted averages of the diffusion readings show that a grouping of the U.S., U.K., EMU and Japan make up averages that are weakening from 12-month to six-month to three-months. The BRIC countries show consistently weaker PMI readings than the total grouping. There is no trend move to weakness for the BRICs. India was an exception as its services sector strengthened sharply in July boosting that country’s readings. For the entire group, both average and median readings show slippage that is consistent from 12-month to six-month to three-month. The global economy is weakening. But is it weak? The percentile standings are telling as well and speak to the question ‘of how weak?’. These metrics evaluate this month’s reading on a time series of readings over the past five years back to January 2014. On that basis, six of 14 of the reporters in the table have a standing below their 5-year medians. That is also a high proportion. In that group of low riders, there are some surprisingly important economies. The U.S. has a 40th percentile queue standing. Japan has a 49.1 percentile standing. The U.K. has a 20th percentile standing. Spain has its lowest reading ever. Italy has a 41.8 percentile standing and Hong Kong has a 30.9 percentile. That’s a lot of weakness in a number of key economies. Interestingly, global growth is slowing and that is in train while globally central banks are either raising rates or biding their time until they can raise them. The central bankers’ perspective on growth is disconnected from the real trends in the global economy. They rely on ‘models’ of future behavior. In the U.S., the Federal Reserve that been raising rates since December 2015 continues to look to hike rates more. In July, the U.S. composite PMI made a sharp transit lower substantially because of decay in the nonmanufacturing index. The Fed in its meeting this week assessed the economy as being hot. For the most part we can’t really easily identify the impact of trade wars on trade and link it clearly to any domestic dislocation. The chart on the Baltic dry goods index makes the opposite point. Trade value has been rising rapidly. Still this chart is hard to read. It may be that some goods shipments were expedited to get to foreign ports ahead on the onset of tariffs. We saw that the export of U.S. soybeans was expedited boosting U.S. exports temporarily. It’s hard to know how widespread that sort of thing might be. The point for now is that central bankers are swimming against the current. The global economy is slowing in a number of venues. PMI gauges no longer are strong and no longer have the kind of momentum they once had. Inflation is still a worry in the back of central banking minds, but not a phenomenon we are dealing with in major currency areas, at least not in our day-to-day reality. Oil prices that have given a strong push to inflation over the past year show signs of prevaricating. We are getting into the interesting portion of the economic expansion...stay tuned.